Bibliothèque du Palais de la Paix | Blog | Palestine in the International Criminal Court: impact and consequences! The year 2014 ended with a cliff-hanger for the Israeli-Palestinian question. Palestinian Authority President Mahmoud Abbas signed the Rome Statute on New Year's eve, a day after a UN resolution mandating Israeli withdrawal from the West Bank failed to pass at the Security Council. As a result, on 6 January 2015, the UN secretary-general confirmed by an official note that Palestine will accede to the Rome Statute of the International Criminal Court on April 1, 2015. In this blog I will explain the meaning of the Palestinian accession, the procedure of preliminary examination by the International Criminal Court (ICC) and possible consequences for the Israeli-Palestinian peace process. 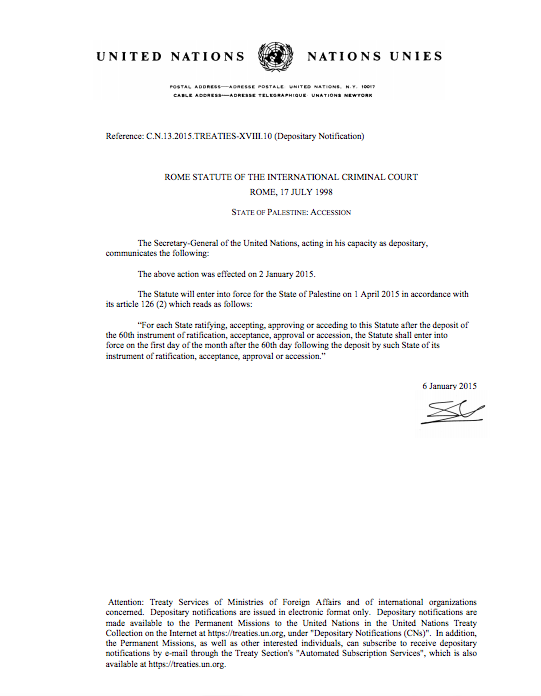 On 7 January 2015, the President of the Assembly of States Parties to the Rome Statute welcomed the deposit by Palestine of the instruments of accession to the Rome Statute of the ICC as well as the agreement on the Privileges and Immunities of the International Criminal Court (APIC), see ICC press release 07/01/2015. Palestine’s accession has prompted certain countries – including Israel, the USA and a number of European states – to warn of potentially grave consequences. It is certainly a risky venture for Palestine given political tensions in the region, but it may deter future war crimes in the Israeli-Palestinian conflict, and marks another step towards statehood for Palestine. In addition to the accession to the Rome Statute and the declaration made by Palestine to the ICC, Palestine has to comply to several international treaties, Protocols as well as declarations. See also the UNISPAL note reproducing the letter of President M. Abbas of Dec 31, 2014. Why would Palestine join the ICC? There are two possible theories on this. The first is that membership would be a further step in Palestine's years-long strategy to gain recognition as a state. Previous steps have included joining UNESCO, and an ill-fated attempt to get the Security Council to vote on Palestinian statehood just recently. The theory behind that strategy is to raise the cost of Israeli occupation by increasing pressure from the international community, and to assert the idea of Palestinian nationhood against a conflict that many Palestinians believe is aimed at robbing them of a state. Palestinian leaders say they are pursuing a new strategy to put pressure on Israel after decades of armed struggle and on-and-off peace talks failed to end the Israeli-Palestinian conflict. They describe it as "internationalising" the issue. The second theory is that the Palestinians actually hope the court will bring charges against Israeli officials, and that exposing them to investigation and prosecution will increase Palestinian leverage in the peace negotiations. On January 16th 2015, the Prosecutor of the International Criminal Court (ICC), Mrs. Fatou Bensouda, opened a preliminary examination into the situation in Palestine. The Prosecutor's decision follows the Government of Palestine's accession to the Rome Statute on 2 January 2015 and its declaration of 1 January 2015, lodged under article 12(3) of the Rome Statute – the Court's founding treaty – accepting the jurisdiction of the ICC over alleged crimes committed "in the occupied Palestinian territory, including East Jerusalem, since June 13, 2014." In August 2014, ICC Prosecutor Fatou Bensouda explained in an article published in The Guardian her position with respect to the lack of jurisdiction of ICC on crimes committed in Gaza. Over 2,100 Palestinians, including 513 children, were killed during that period . A preliminary examination is not an investigation but a process of examining the information available in order to reach a fully informed determination on whether there is a reasonable basis to proceed with an investigation pursuant to the criteria established by the Rome Statute. Specifically, under article 53(1) of the Rome Statute, the Prosecutor must consider issues of jurisdiction, admissibility and the interests of justice in making this determination. The Office gives due consideration to all submissions and views conveyed to the Office during the course of a preliminary examination, strictly guided by the requirements of the Rome Statute in the independent and impartial exercise of its mandate. There are no timelines provided in the Rome Statute for a decision on a preliminary examination. Depending on the facts and circumstances of each situation, the Office will decide whether to continue to collect information to establish a sufficient factual and legal basis to render a determination; initiate an investigation, subject to judicial review as appropriate; or decline to initiate an investigation. Firstly, ICC membership can be considered as an act of non-cooperation with the peace process by the Palestinians. That happens in a lot of peace processes, but the Israeli-Palestine process in particular has suffered an awful lot of setbacks before. But when one side undercuts the peace process, that makes it harder for the other side to make difficult concessions. In this case, it may make it more difficult for Israel's leaders to convince Israeli hardliners to agree to concessions, because they'll be able to argue that Palestine can't be trusted to engage in good faith. That limits the scope of negotiations, and makes peace more difficult. At the same time, on the other side Israel has been resistant to reaching a peace deal that it is necessary for Palestinians to bring greater international pressure to force Israeli leaders to make necessary concessions. Secondly, ICC membership would limit the opportunity to offer amnesty for leaders on both sides as part of an eventual peace deal, because the ICC wouldn't be bound by any bilateral amnesty agreement between Israel and Palestine. In other words, Israeli and Palestinian leaders can't sign a peace deal in which they promise to grant one another's leaders amnesty, because that amnesty won't extend to the ICC. From the perspective of international justice that could be a good thing. Finally, the ICC could impact Palestinian politics if its initial investigation or prosecution focuses on Hamas, which has long feuded with Palestinian leader Mahmoud Abbas's Fatah party. That could affect the balance of power within Palestinian politics, and make it more difficult for Palestinian leaders to negotiate with full authority. The ICC membership of Palestine, means that after decades of being immune to and not bound by international law, Israel's actions are being exposed to legal scrutiny. And so, for that matter, will the action of Hamas in the Gaza strip. Where attempts for political and diplomatic solutions have failed, taking the issues to the international courts, maybe a sensible scenario - not just for the Palestinians, but also for the Israelis. Burra, S., "Palestine and the Belated UN Non-Member Observer State Status", Indian Journal of International Law, 52 (2012), No. 3, pp. 591-599. Deeb, D. J., Israel, Palestine, and the Quest for Middle East Peace, Lanham, MD, University Press of America, 2013. Syracuse, New York, Syracuse University Press, 2014. Meloni, C., Is there a Court for Gaza? : a test Bench for International Justice, The Hague, The Netherlands, T. M. C. Asser Press, 2012. Kontorovich, E.,"Israel/Palestine - the ICC's Uncharted Territory", Journal of International Criminal Justice, 11 (2013), No. 5, pp. 979-999. LeVine, M., Mossberg, M., One land, Two States : Israel and Palestine as Parallel States, Berkeley, University of California Press, 2014. Ronen, Y., Israel, "Palestine and the ICC - Territory Uncharted but Not Unknown", Journal of International Criminal Justice, 12 (2014), No. 1, pp. 7-25. Zimmermann, A., Palestine and the International Criminal Court Quo Vadis? : Reach and Limits of Declarations Under Article 12 (3), Journal of International Criminal Justice, 11 (2013), No. 2, pp. 303-329. ICC Press release 07/01/2015 "The State of Palestine accedes to the Rome Statute"
ICC Press release 16/01/2015 "The Prosecutor of the International Criminal Court, Fatou Bensouda, opens a preliminary examination of the situation in Palestine"
Article Guardian "Fatou Bensouda: the truth about the ICC and Gaza"